In the previous post, we discussed open-ended straps and how they attached to bags. Today's post is all about closed-ended straps. 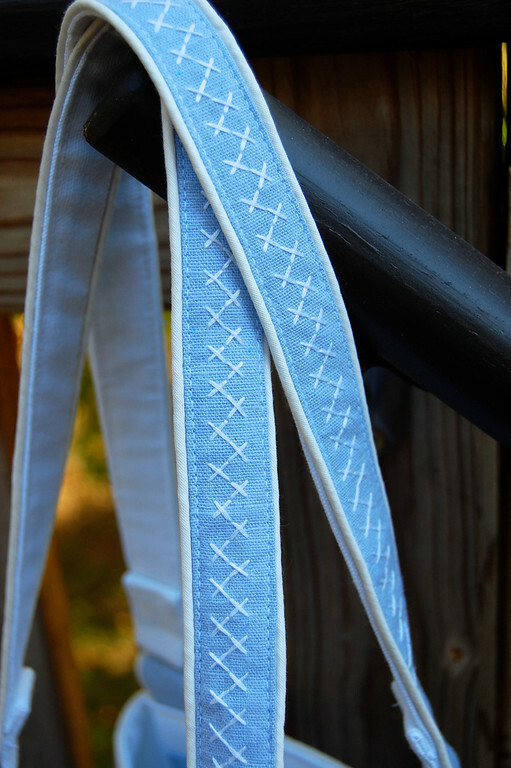 Closed or finished straps have ends that are completely sewn up so there are no exposed raw edges. 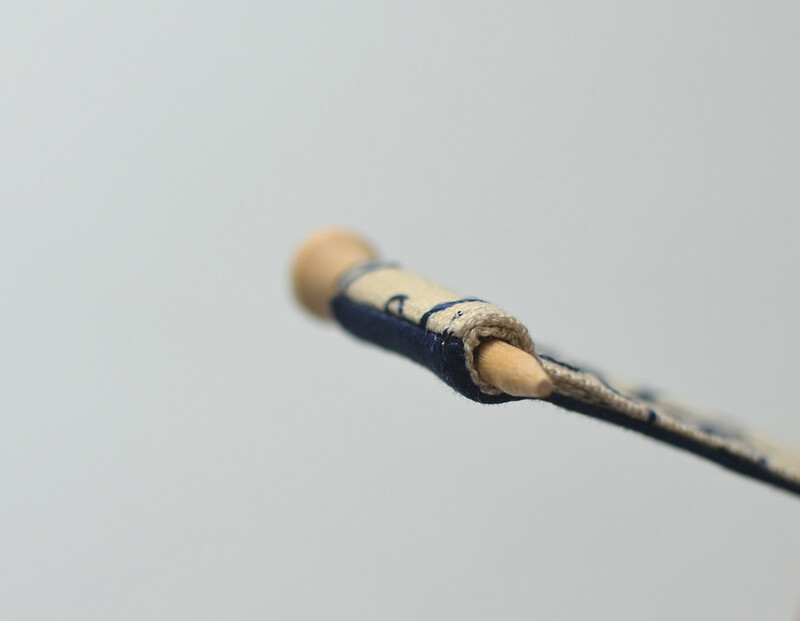 These finished ends do not have to be inserted into seams; they can be attached to bags in other ways. The Truly Reversible Integrated Loop Strap. Shudder. Do you hate those silly names? Me, too, but I couldn't think of how else to describe them. Sorry. 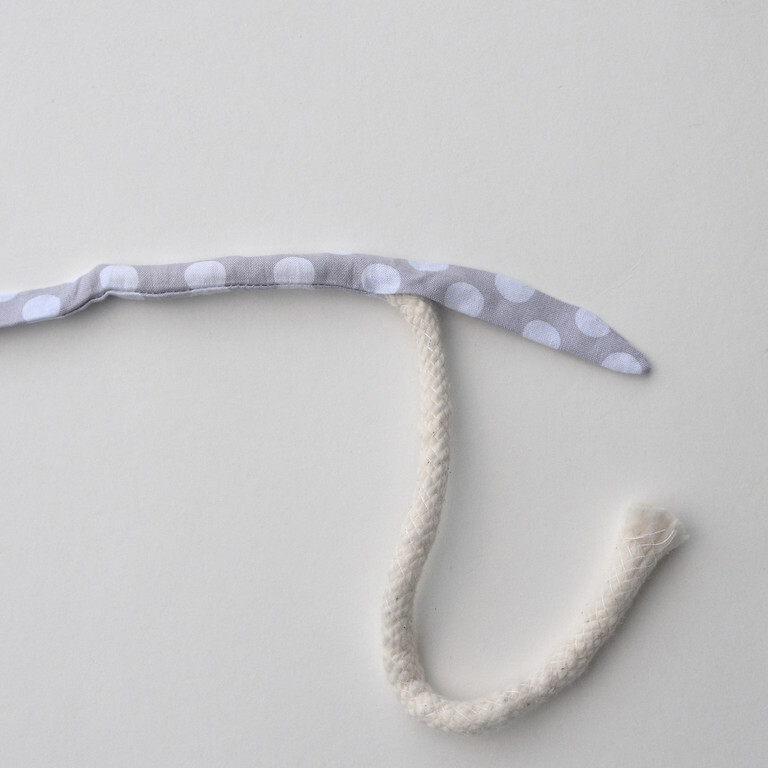 This strap is literally free-standing. 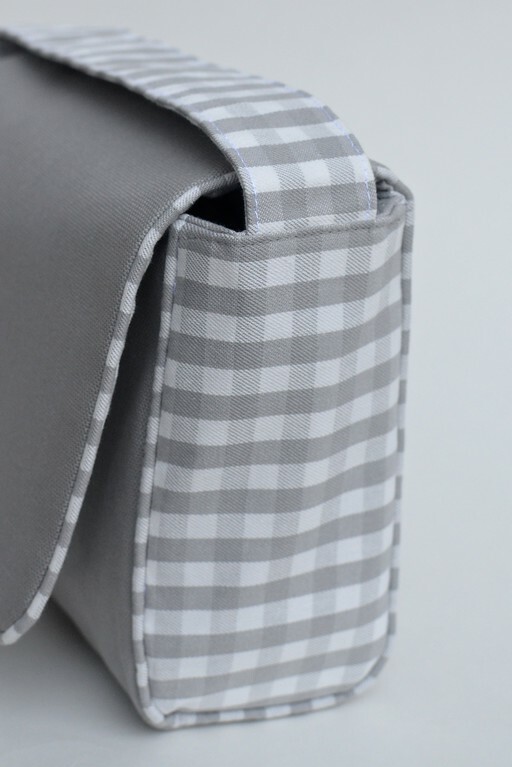 It can be sewn permanently onto the fabric of a bag or remain detachable, fastened temporarily onto a bag by buttons, snaps, ties, buckles or any other device you like. 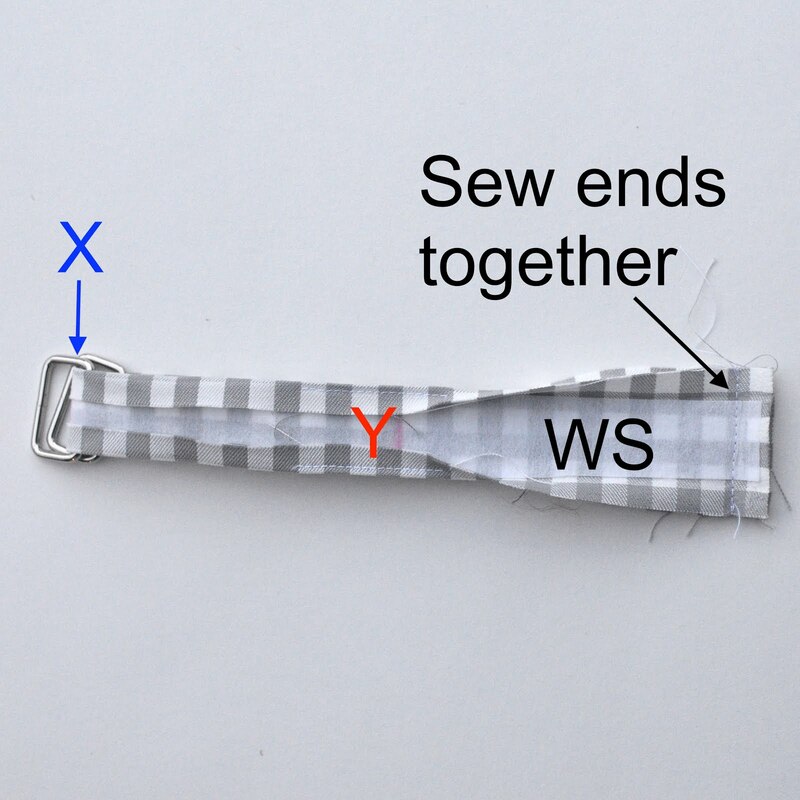 Here is a method for making a closed strap with rounded ends. 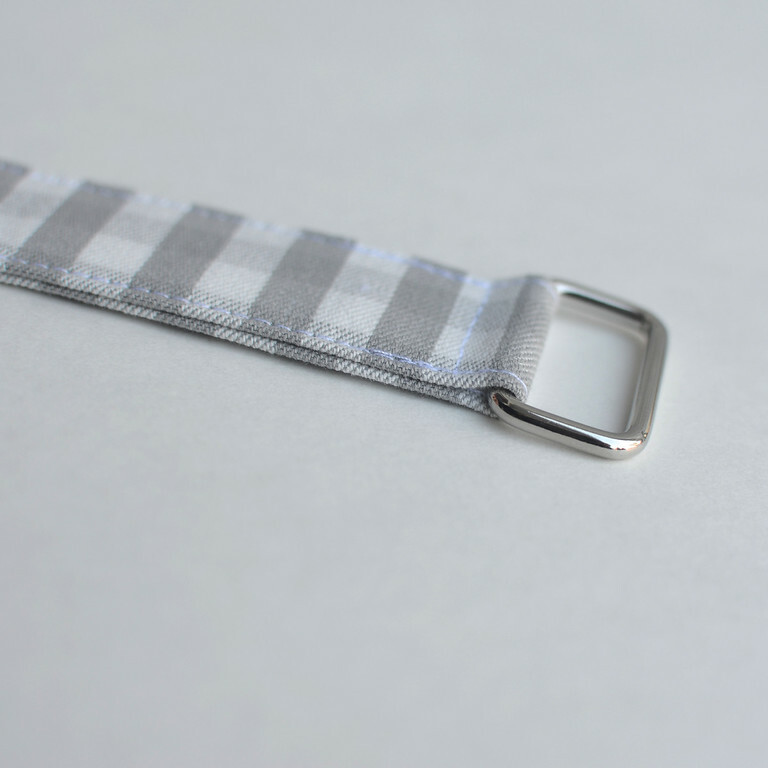 This strap is made with two fabrics, so that it is reversible. 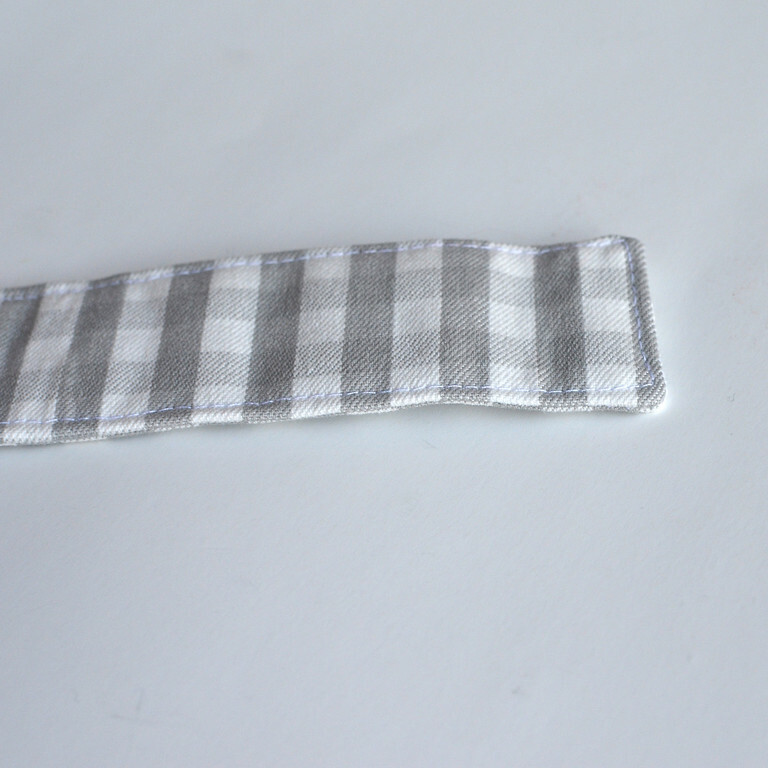 One one side of the strap you can see the white interfacing, which is of the finished size and shape, surrounded by a grey border, which is the seam allowance (SA). 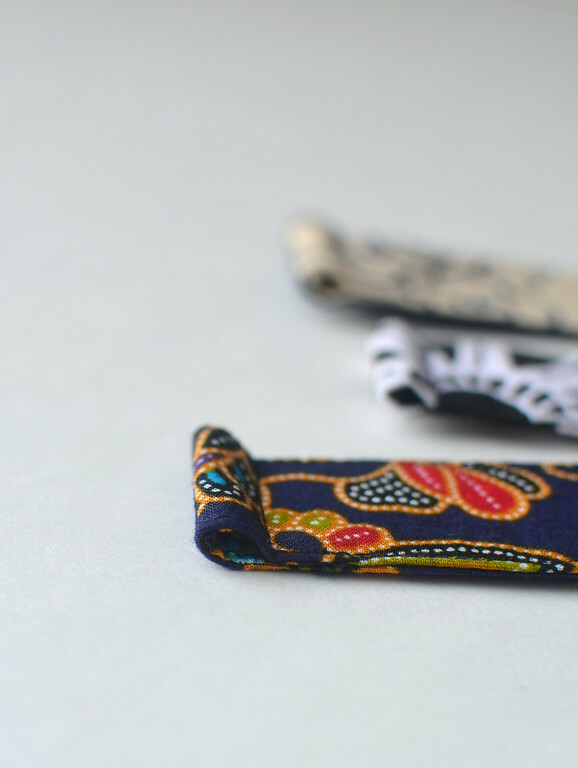 The other side of the strap is made with the brown printed fabric. 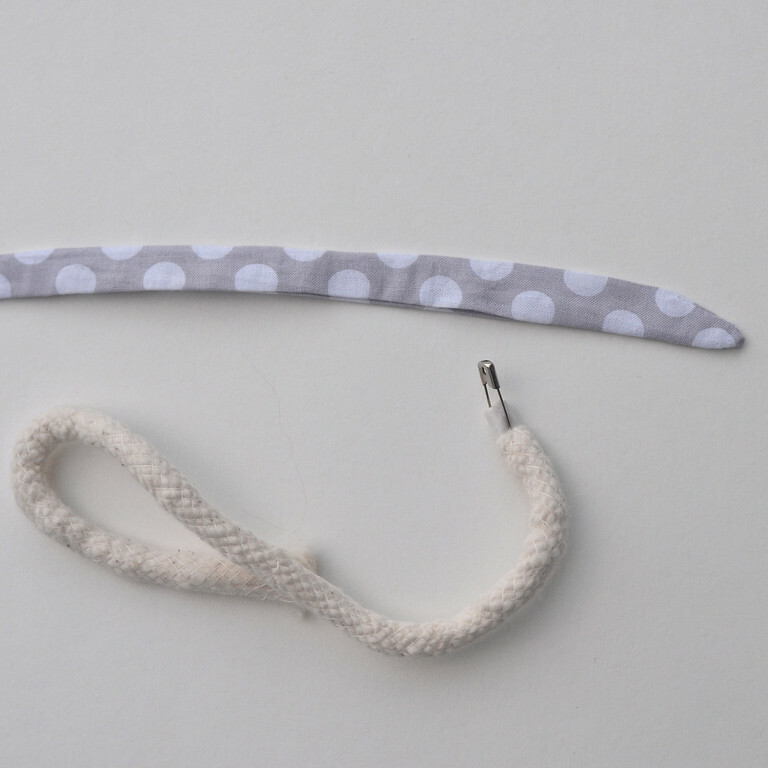 The four pieces at the bottom of the picture will become a pair of anchors for this detachable strap. and the entire strap turned RS out through that huge opening. 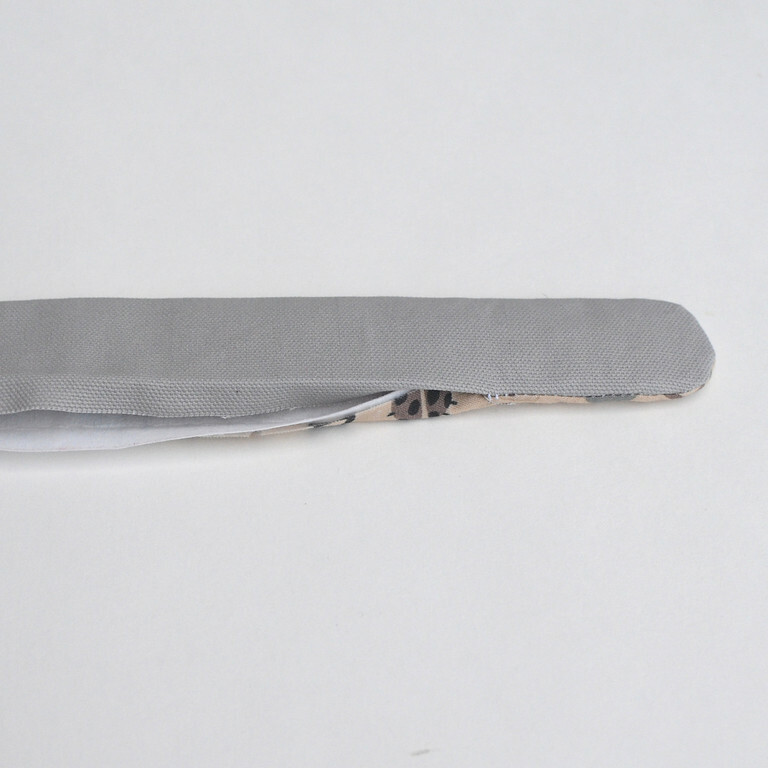 The SAs of the opening are pressed inwards and the entire strap is edge-stitched all around, closing the opening in the process. Here are some other similar straps showing this edgestitching. 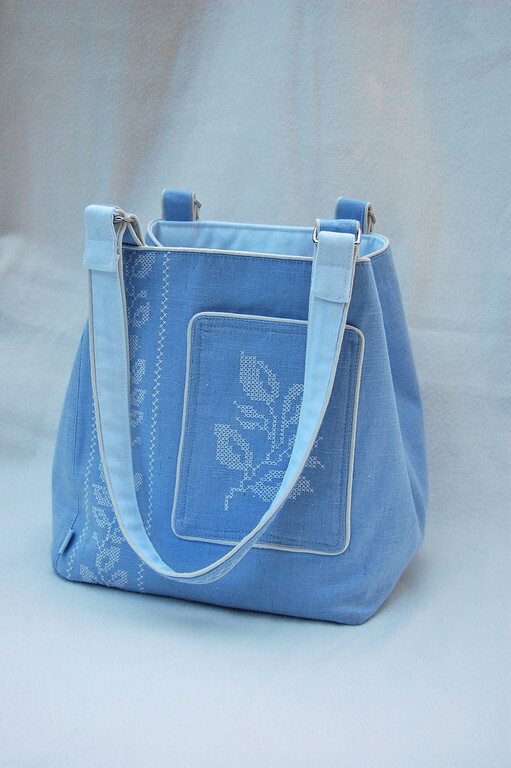 but it can also be buttoned directly on to the fabric of the bag. 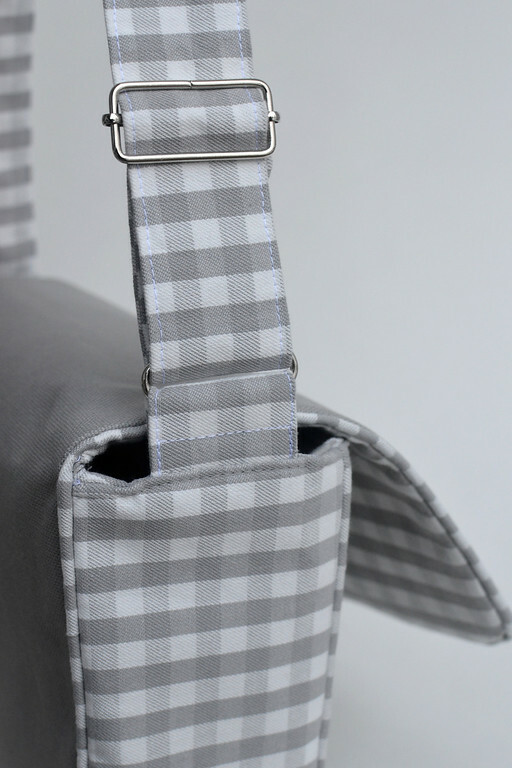 This strap is closed on only one end - the other, open end is inserted into the top seam of the bag. You will see this in later photos. Start with one short strap - this will be the anchor, and it goes with the single loop. 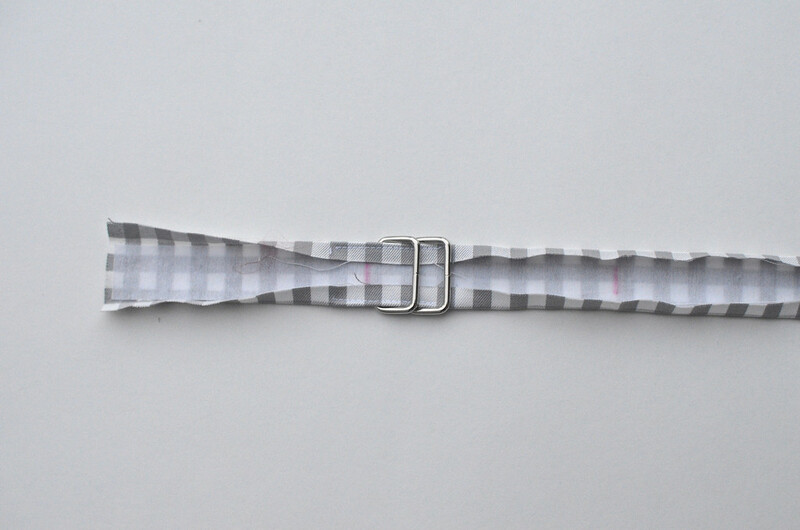 Sew this up like a typical open-ended strap. The longer main strap goes with the sliding loop that has the middle bar. This is the one we will be working on in the next few photos. as shown by the red stitching line. 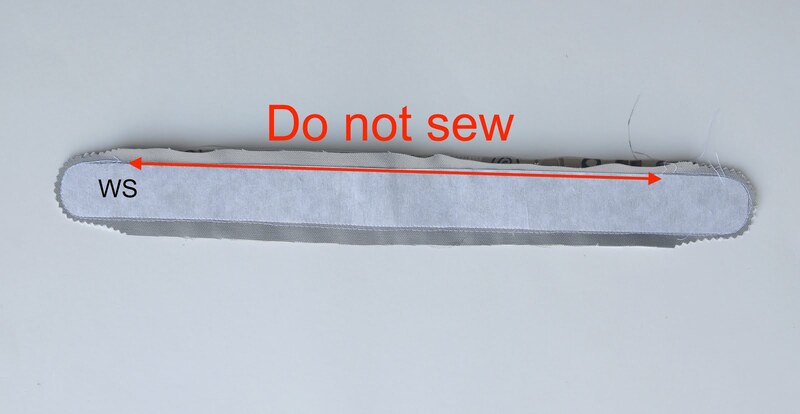 Leave one end open (this will be inserted into the top seam of the bag later) and most of one long side unsewn (blue arrow) all the way to the open end. Sew the other end closed and clip the corners of its SA to reduce bulk. 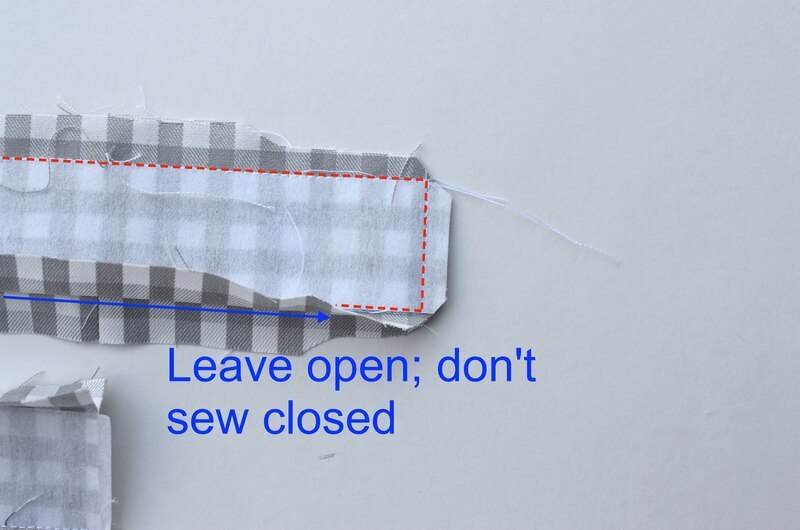 Turn the entire strap out through this big opening and edge-stitch all around, closing this opening in the process. Note: because this strap has one open end, you could choose not to leave the big opening and instead turn the entire strap RS out through the small open end. I personally wouldn't, because it would mean crumpling the interfacing, not to mention a lot of tugging and chopstick-work (or pliers). Slide the closed end over the middle bar of the sliding buckle and stitch it down. 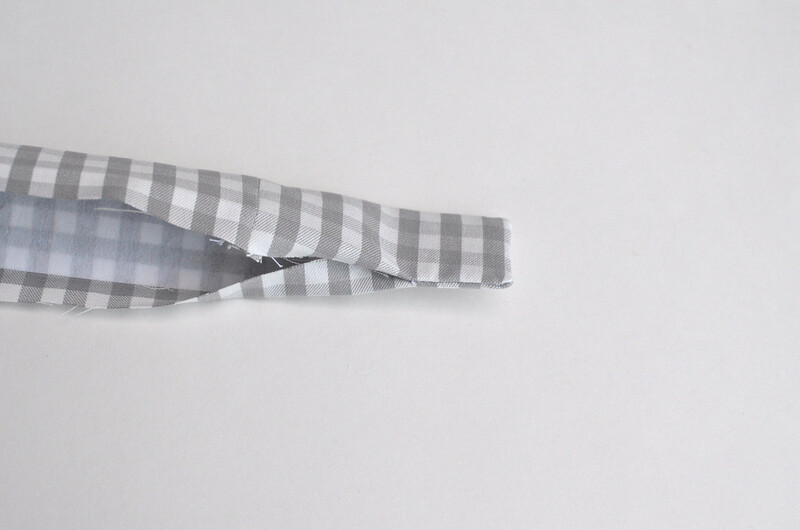 Below are two photos showing the same thing done with an open-ended and a closed-ended strap, just to prove a point. The photo on the left is of an open-ended strap. 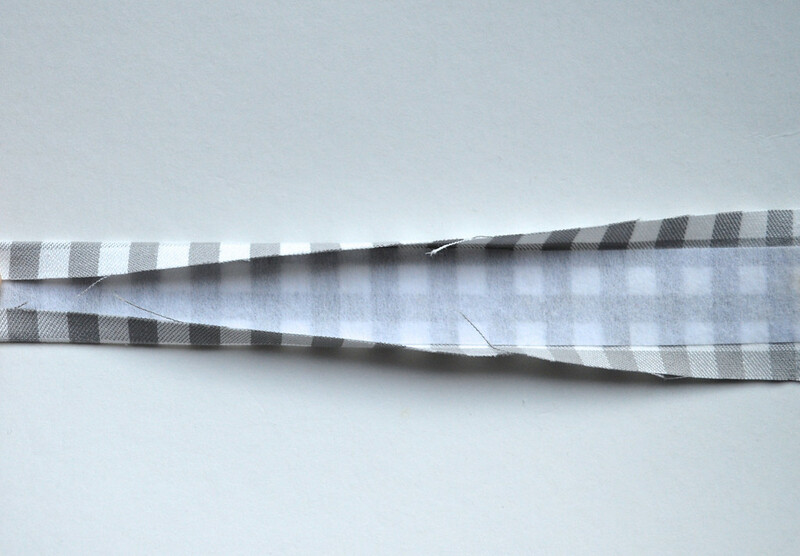 Notice that its unfinished end requires it to be folded inwards to tuck the raw edge away. 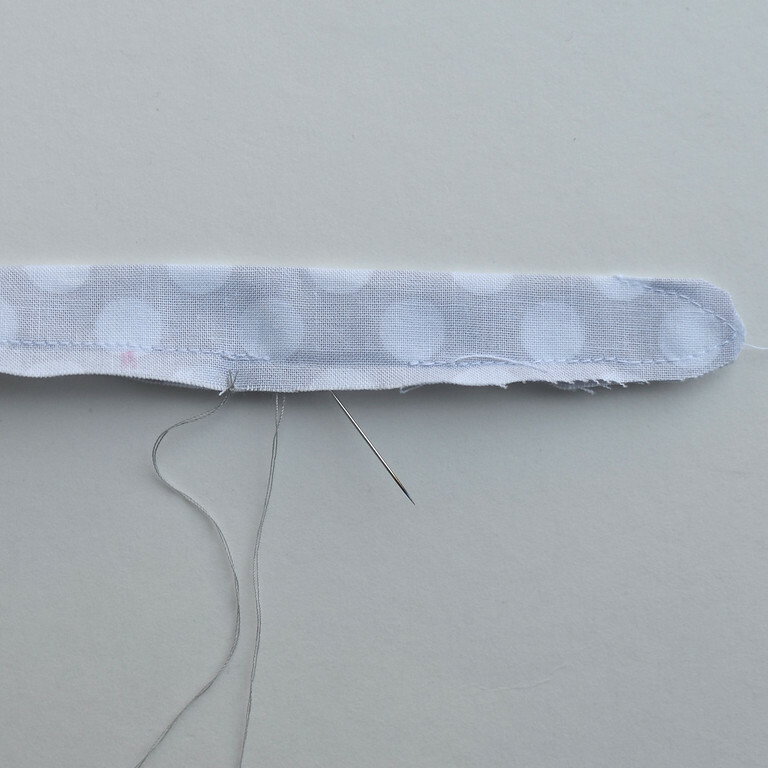 This introduces bulk, which could mean your needle works that much harder not to skip stitches when going through the layers. This might be a moot point if you are using thin fabric with no interfacing but my straps are always thick and stiff, so I'm always conscious of ways to reduce bulk. The photo on the right is of a closed-ended strap doing the same thing. Because its end is closed, it does not require an extra inward fold. Less bulk = easier to sew, and neater. 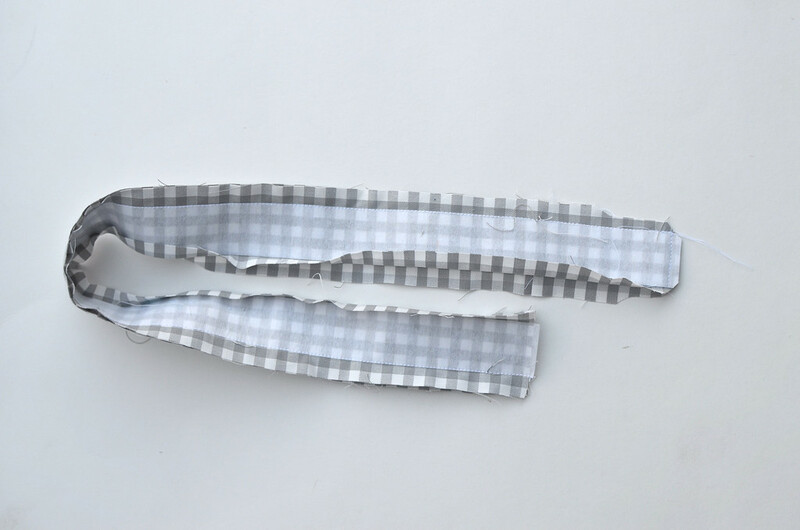 Left photo: the open end of the main strap is inserted into the top seam on one side. 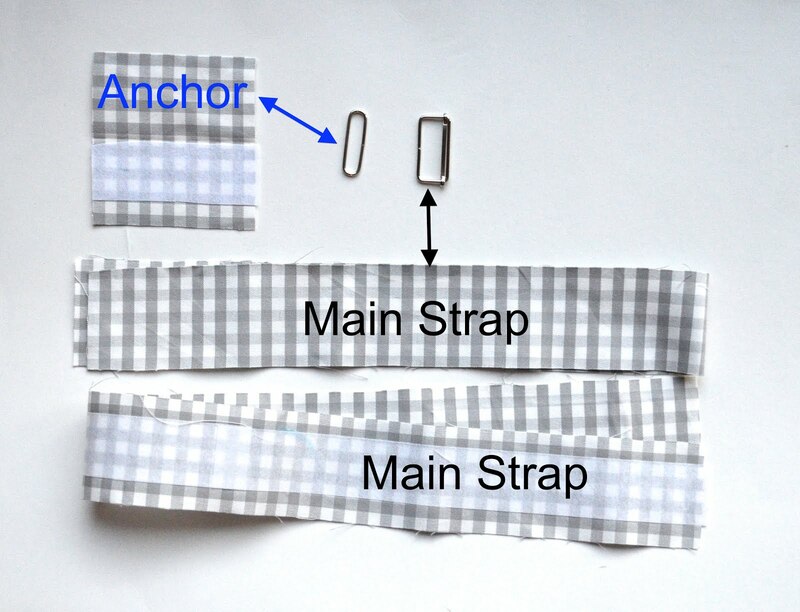 (Right photo: the anchor is inserted into the top seam on the other side, with the closed end of the main strap connected to the anchor through the single loop and sewn around the middle bar of the sliding loop. As mentioned in the previous post, being inserted into this top seam allows the strap system to be fully reversible along with the bag. If, however, this reversibility is not important, you can also attach the strap anchors to the outside of the bag, as in the photo below. This is just a strap enclosing a cord for structure. 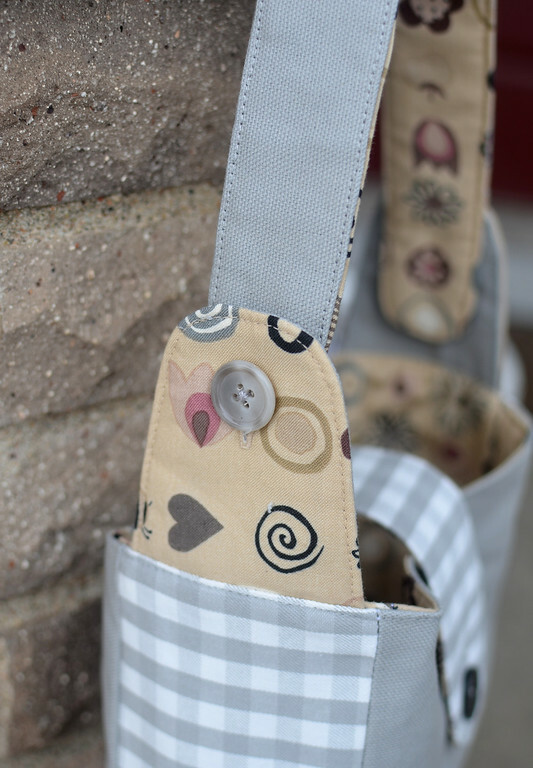 You can easily find tutorials online for making these with various configurations of open ends and closed ends and numerous clever ways to turn the strap inside out with the cord magically enclosed. 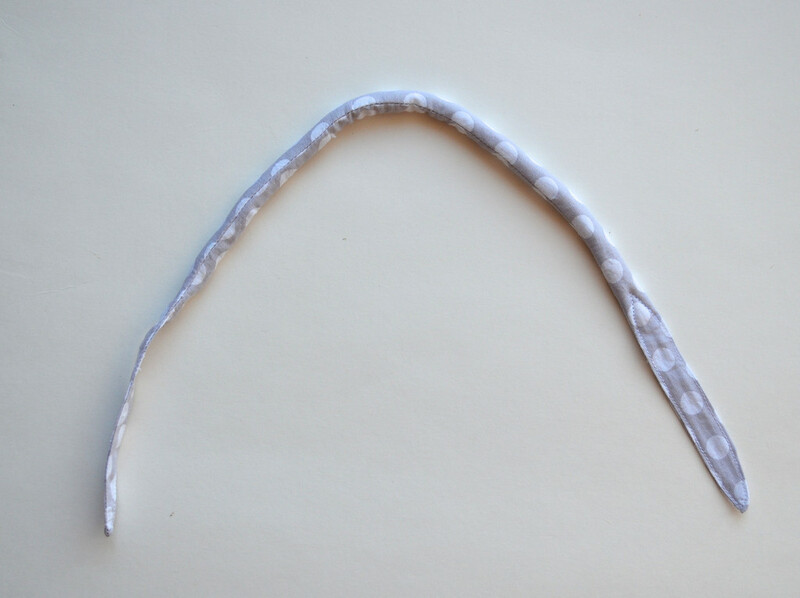 Just for fun, let's make a partially-corded strap with two closed ends. We haven't done a folded closed strap yet, so let's do that here as well. 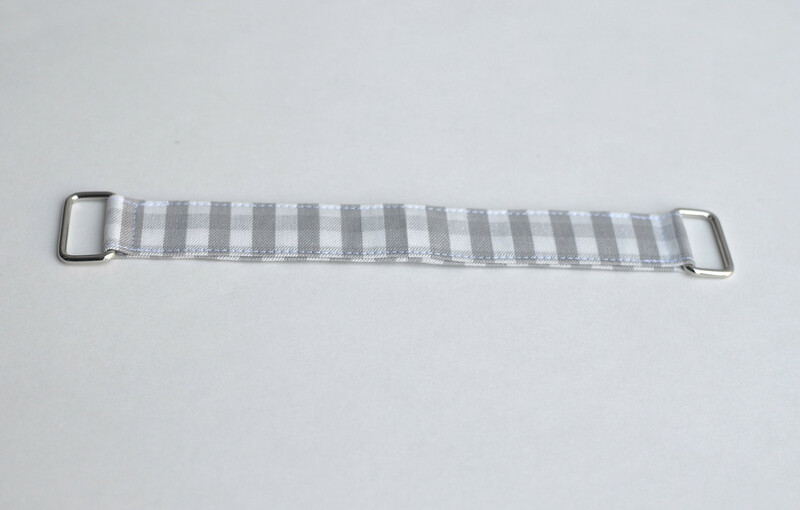 Cut a double-width strip of fabric for the main strap. 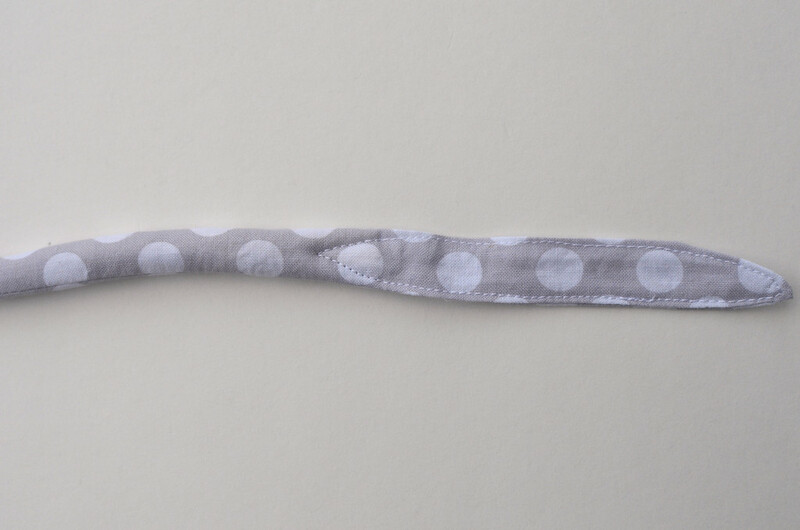 Many people will cut this strip on the bias, since it's going to curve around the cord in its role as a bag strap. I chose not to, for two reasons: one, I was being stingy with my fabric, and two, I liked the polka dot print in this grain alignment. And honestly, with this fabric, it didn't make a significant difference. Also make two anchors - mine were finger-shaped. I also left them open at one end because the fabric was thin enough for its SA to be tucked under later without introducing too much bulk. 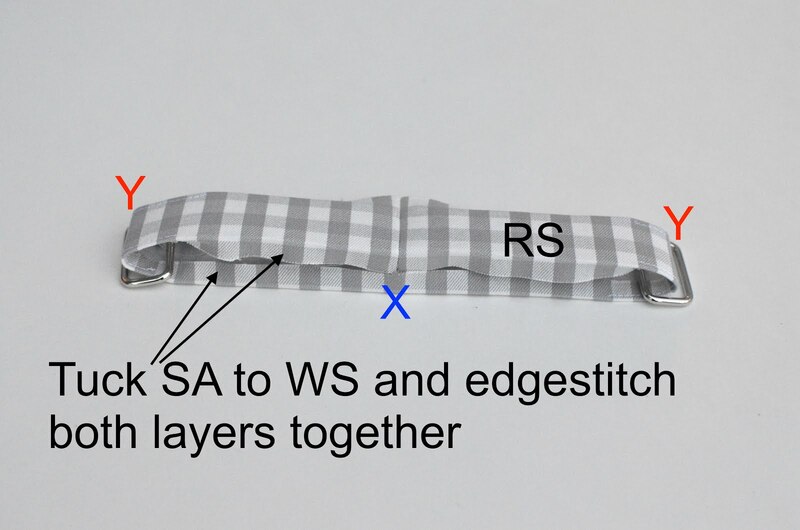 The main strap was folded along its midline, RS together, and sewn as shown. Two openings were left - these were roughly where the ends of the cord would lie. I thought I'd share one way of turning skinny straps inside out (apart from Slow Death By Chopstick or Tugging With Pliers, my other two unfavorite methods). 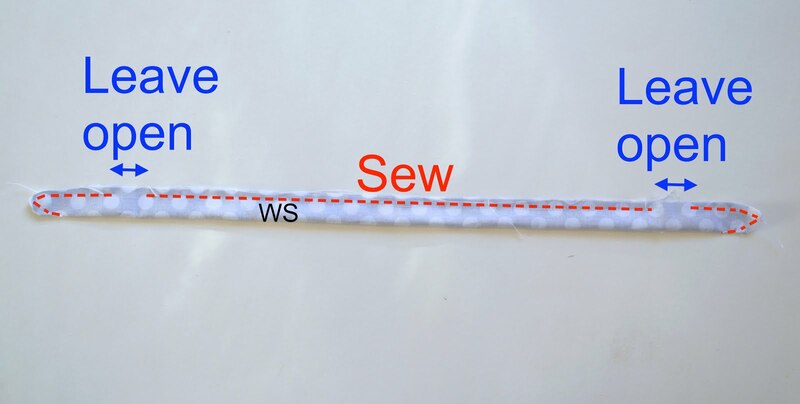 Left photo: Sew a knot in the seam allowance near one end of the strap. I sewed my knot at some random point just because it was nearer the opening. 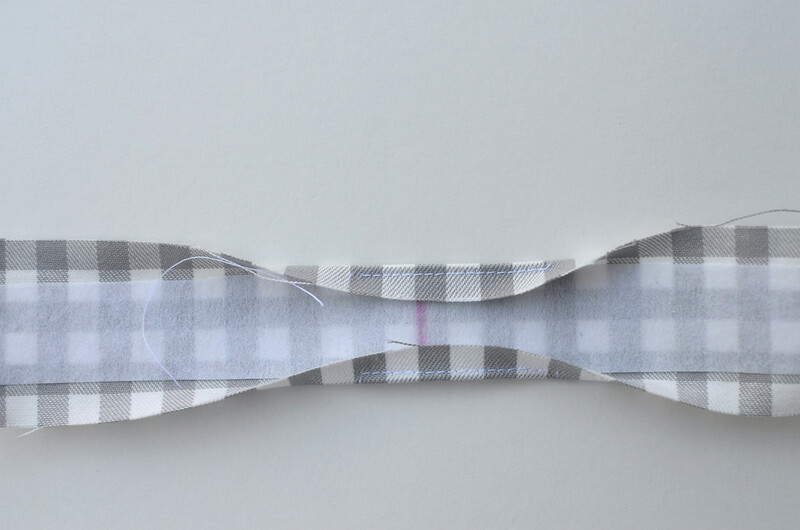 You can also sew it right at the end and poke it through the fabric. till it emerges at the other opening. 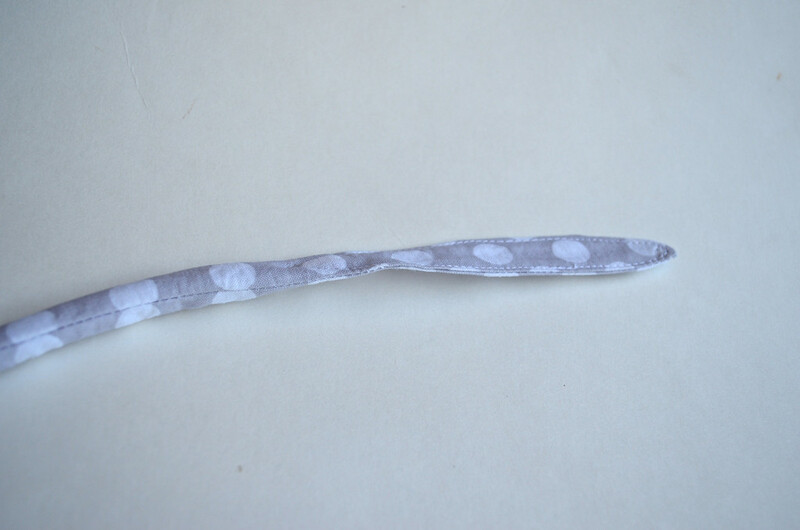 The entire tube will bunch up, especially as you begin pulling the rest of the trailing thread out behind the needle. Invert the end of the strap with the knot through the strap and slowly pull the thread till the end turns right side out through the strap, following the thread. When the strap is completely RS out, thread the cord through it with a safety pin. 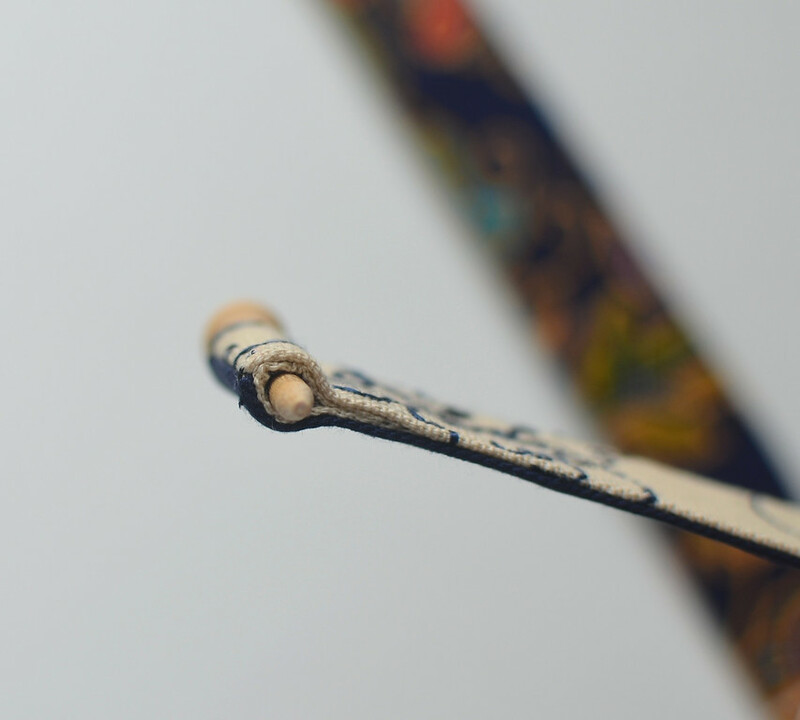 The two openings allow you to easily adjust the position of the cord so it lies centrally between the two ends of the strap. Edge-stitch the ends of the strap, to close the openings as well as to secure the ends of the cord in place. Finished corded strap! This one is closed at both ends (i.e. it's a free strap). and then tie the straps on. Not really a LiEr kinda style- I suspect it endears more to the ruffles-gathers-florals personalities - but still pretty. See - I just wanted to show you that I don't only make bags that I like. Sometimes I have to make bags other people like. Groan. It's so hard to be selfless. Hardware is very cool in bags. 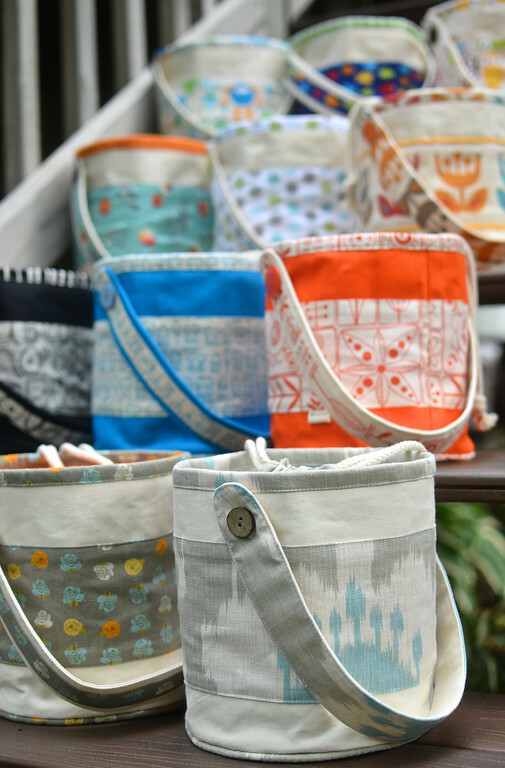 Some people think that hardware makes bags look less homemade and more store-bought. That may be true IF they are properly installed. Last Spring, I made these reversible watch straps for Mum with a channel for hardware, for attaching to the lugs of her watches. This method can be used for bag straps as well, when they need to go around loops AND need to be reversible. Here are those straps in action with their bag. Such a beautiful bag, yes. But do you see it? Do you? Are you shielding your eyes from the horror of the way the ends of those straps fold over the metal loops? In my (feeble) defence, I was choosing between piping and true reversibility when I made those straps. Yes, it is possible to have both i.e. I could have made this bag strap look just like my mother's reversible watch strap AND have piping but I convinced myself that because this blue bag wasn't meant to be reversible, the straps didn't have to be, either. Very poor logic - apparently it had completely slipped my mind that the important issue was good tailoring, not novel reversibility. I am very ashamed. 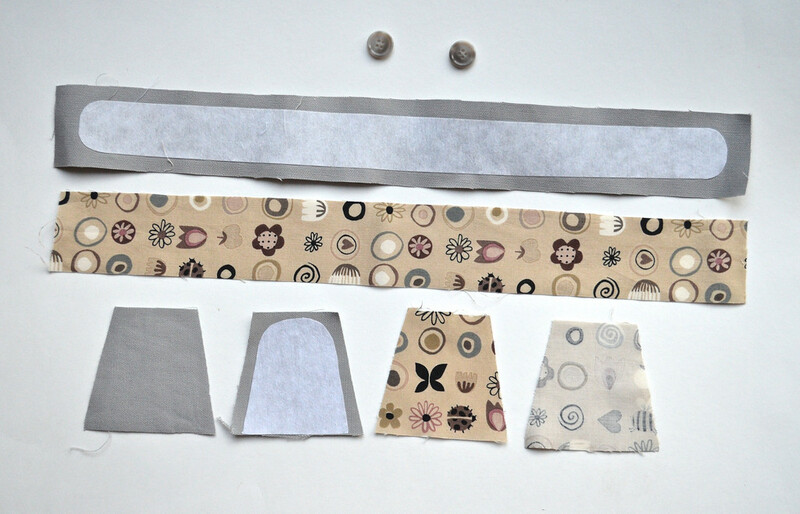 So to make atonement for all the ugly looped bag straps I have ever made, I am teaching you how to make The Truly Reversible Integrated Loop Strap. Without piping, of course - we don't want you to be distracted and make the same mistake as I. 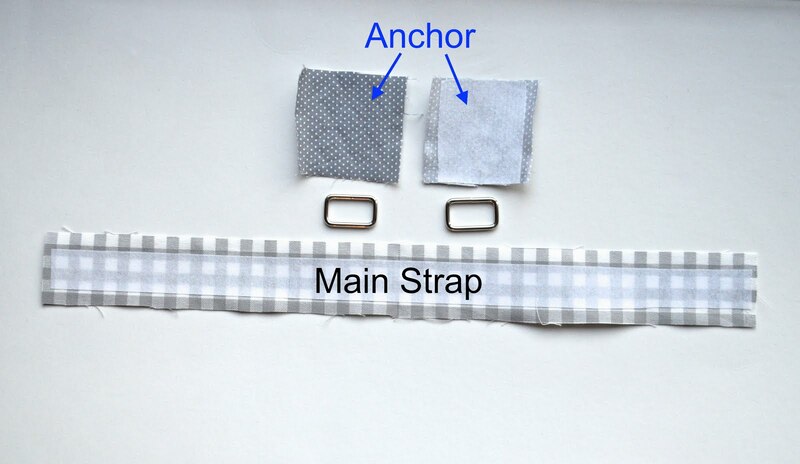 Start out with two anchors, two loops and one main strap that is twice the length of the finished strap. Press the SA towards the WS of the strap. Mark on the WS, the midpoint (X) and the quarter points Y (when measuring the length of the strap, exclude the SA of the ends). 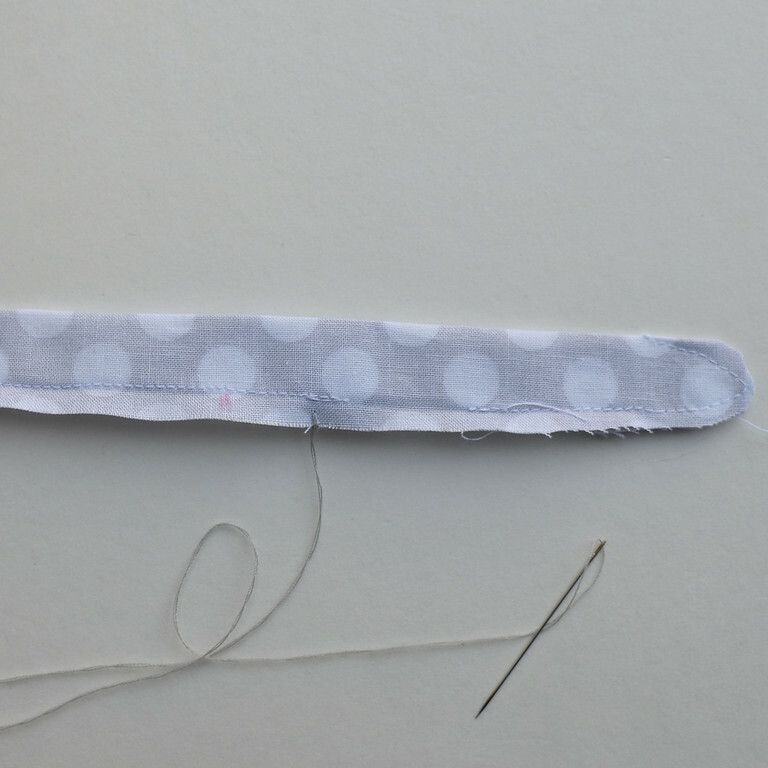 Fold in the SA around the quarter points and edge-stitch them down. Here's a close-up. I'd sew about 1" to either side of the actual quarter mark. Slide the two buckles onto the strap. Push the buckles to the midpoint, fold the strap in half, RS together, line up the ends and sew the ends together. 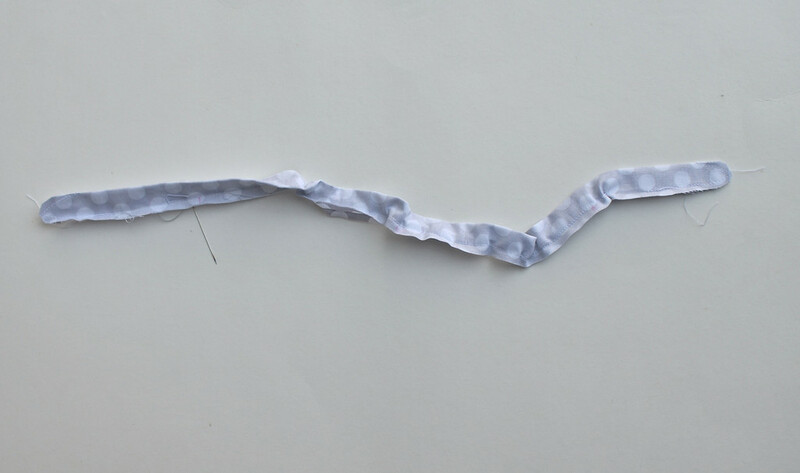 You will now have a loop, or a double-layered strap, the length of which is the finished length. and edge-stitch both layers together. You will be sewing over part of the earlier stitches near the metal loops. 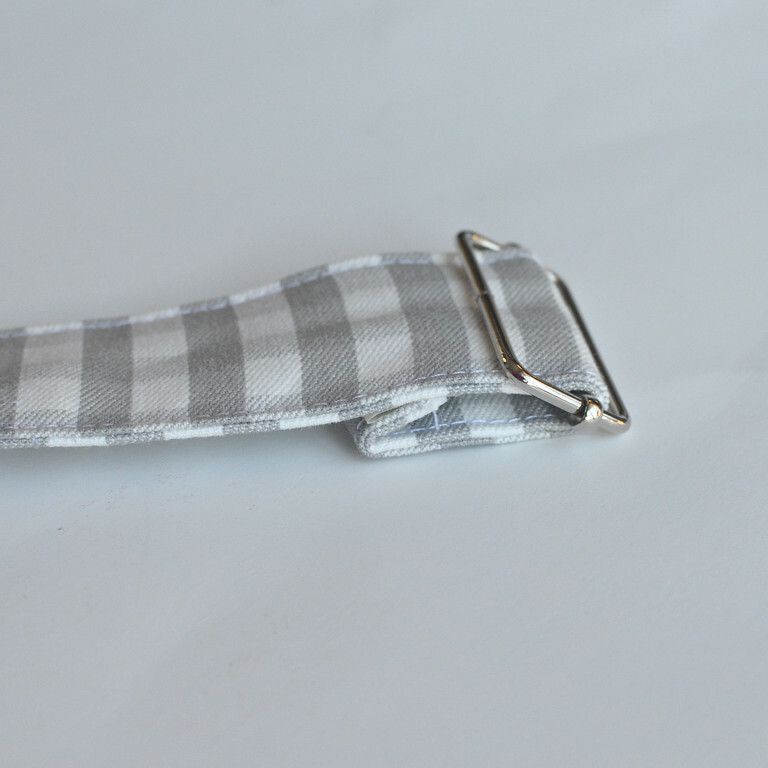 This is the finished strap. When those straps flop over to expose their backsides - still perfection. And if you'd used two fabrics so that one coordinates with the bag lining, this strap would be truly, perfectly reversible. Here's a pictorial summary of our four straps, their anchors and their attachment/fastening device. Naturally, they're not in order, because I wasn't thinking when I took the photo. You killed me with "Slow Death by Chopstick"... I confess I've been killed a thousand times! 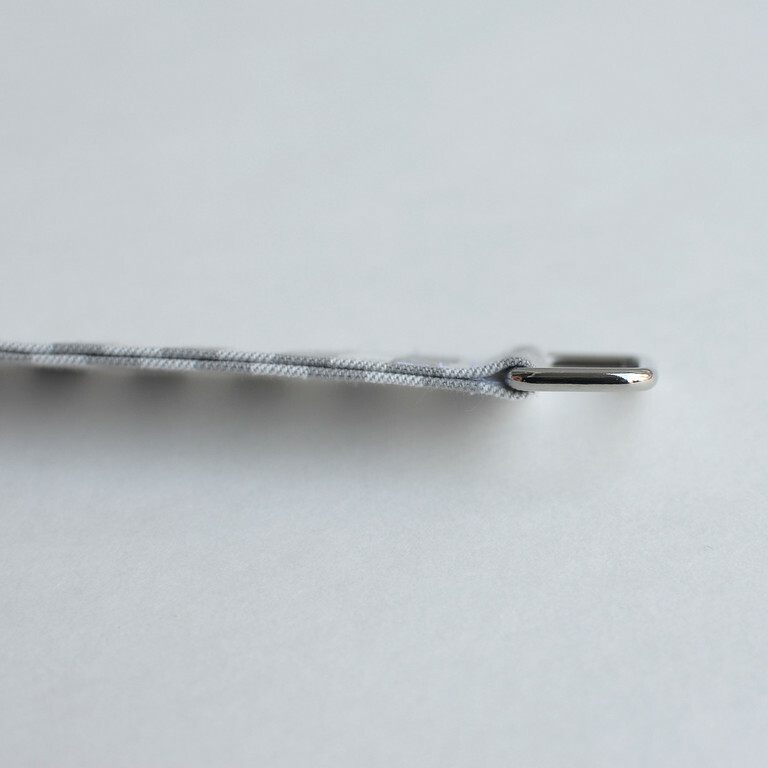 On 4 The Truly Reversible Integrated Loop Strap, could the 1" edgestitch be made with long stitches and later removed? Bea: No. The edgestitching must be permanent, so that it looks like it is continuous with the rest of the edgestitching on the strap. It isn't a basting stitch to hold the SA down around the metal loop. I am in awe of this series - I can't believe you are making this resource available for free. Thank you so much, LiEr! I will conquer my fear of bag-making yet! MaryAnne: My point exactly! Such information should be common knowledge to anyone who wants to make a bag. Or at least it should be stuff that we learn in free tutorials. 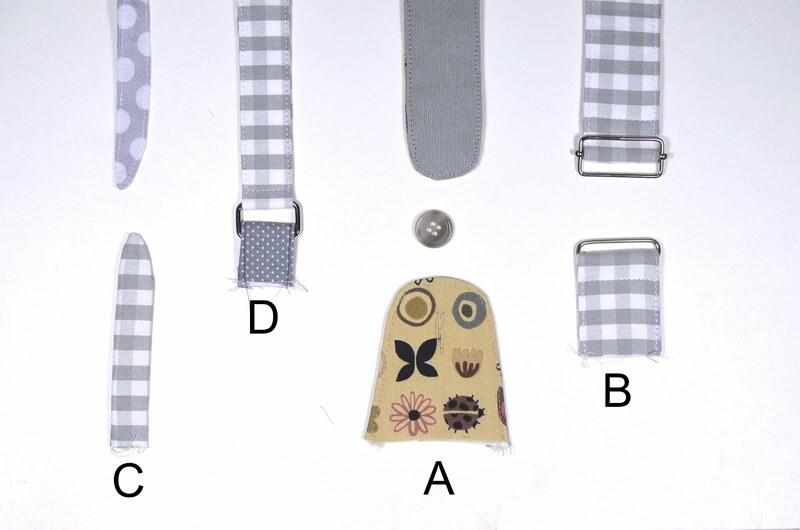 No one should need to pay money for a pattern that shows how to make a strap. I mean, really!!! 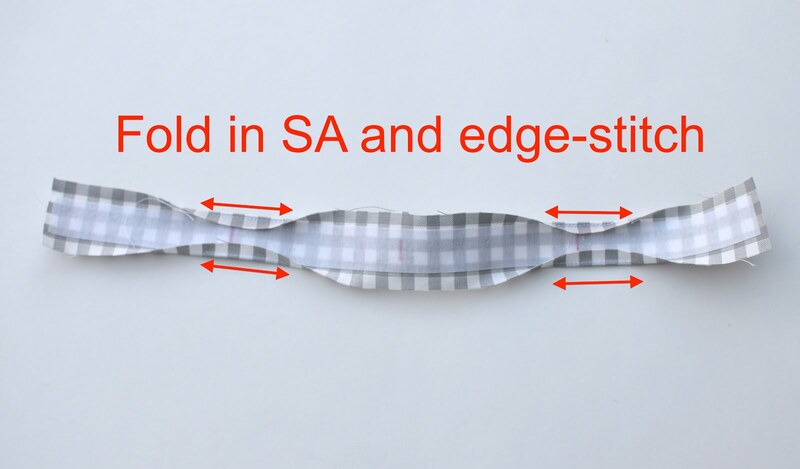 Patterns should set the bar far, far higher than just "and here's how to fold a strip of fabric in half and turn RS out to make a strap!" and actually offer unique design and higher-level techniques so people feel they've had value added to their sewing repertoire after using the pattern. Even beginners. But that's just my own opinion. I know not everyone thinks like me! Well, everyone should think like you because you make excellent sense. Thank you for your generosity and time. 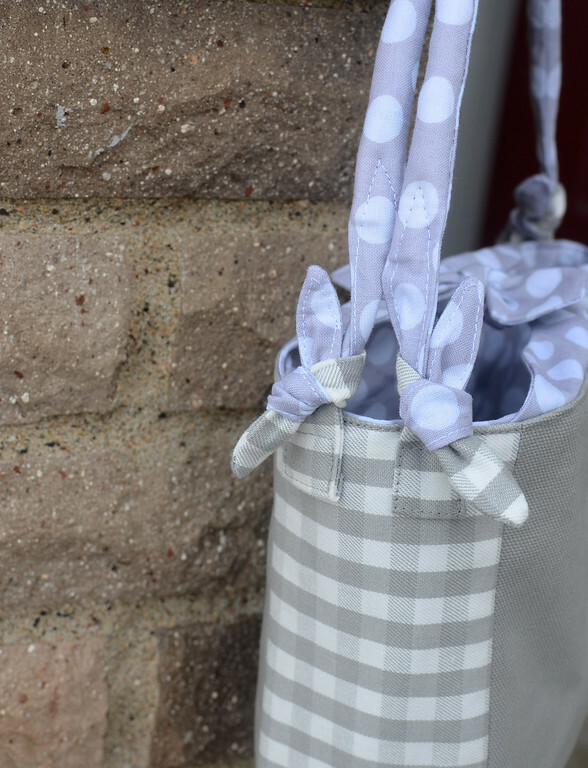 I have made a couple bags from patterns and have learned more in these few blog posts than those patterns. You explain the way I have to learn: I want to know the how but I have to know the why of the how! 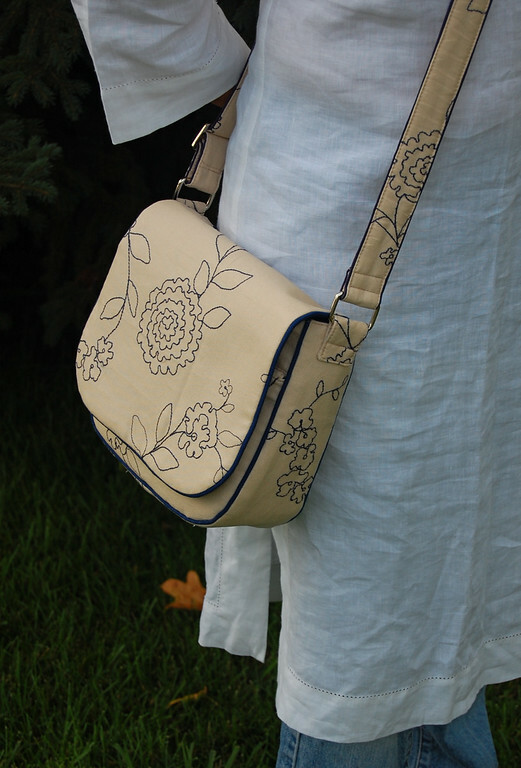 I can't tell you the first thing about the bags I have made without going back to the patterns. 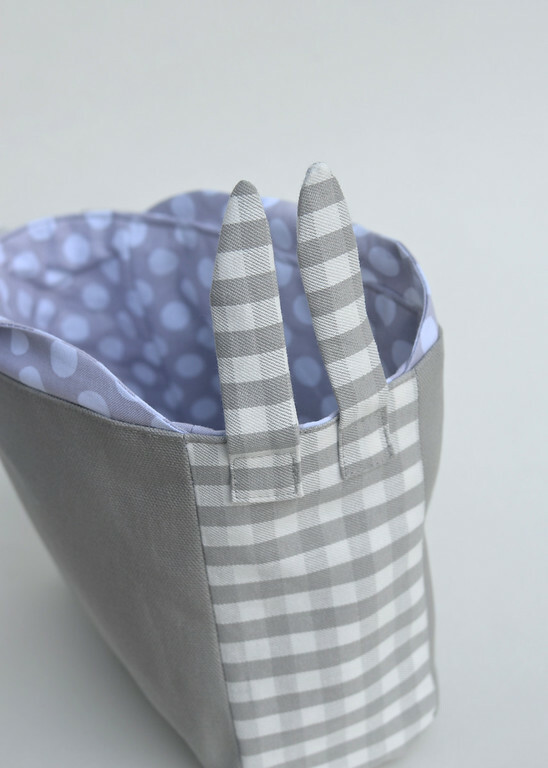 Now I can completely explain how to make bag handles without any referencing at all. That is priceless. The teaching profession lost a priceless gem when you retired. Sorry for the sappiness, but to find someone who is in sync with my brainwaves is very difficult and (please let me say it one more time) priceless. Such great information! I guess there really is no end to strap possibilities, is there? This is a fabulous tutorial, thank you so much for sharing your knowledge and life lessons! I am making my first bags ever at the moment. I am so happy with them and have used a few of your tricks. They have a stap like 'B' in your tutorial. When I got to the strap I could not for the life of me understand the instructions, it didn't help that I couldn't source the right slider combination locally in time to finish the bags as presents for Christmas. So I did something I am not happy with and asked my friends for a strap length and anchored the strap at both ends to the bag (now I have seen this tute I now know there are so many other options, thanks). However I still have a bag to finish for myself, I now have the right hardware but am still confused. Your tute helped a lot however I have a query 'Slide the closed end over the middle bar of the sliding buckle and stitch it down. I ran out of room -Lol. So, where do I actually sew it down, around the middle loop or enclose the whole slider? I hope that make sense, maybe a photo showing the back of the strap might help. Thanks. As will I. Ah, my Wedgewood Bag, as I call it. Possibly the prettiest bag I've ever made. Not that it's mine anymore. And actually, I don't think my MIL minded the horror bit, either! Thank you for this series - I am finding it so interesting! Also, I'm glad you are selfless enough to make this info public. And for that matter put in the time and effort to do so. I've seen people sell patterns for what is essentially a circle skirt! Don't know if my last comment made it through, but just wanted to thank you for taking the time to make these tutorials and making them free too. I am an experienced sewer and could probably figure out most of these things after a few hours of thinking, but it's nice to not have to think and just look at all your examples and just use them -- if I ever have time to make a bag (have a baby and a preschooler). I've seen people sell patterns for what is essentially a circle skirt. This is a very good series. I appreciate it! What totally awesome instructions and photos!!!! Thanks so much for sharing! 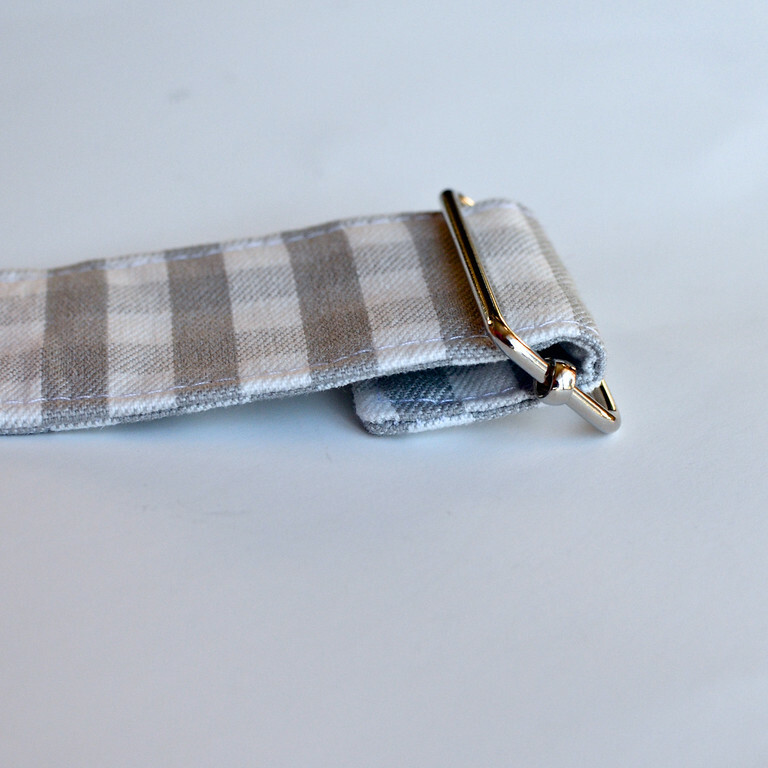 I have your blog in my bookmarks bar because I will definitely be making lots of bags using your tutorials!!!! Hopefully I will eventually be able to do the straps without constantly looking at your tutorials....you're a great teacher! I would never have figured out the The Truly Reversible Integrated Loop Strap without your instructions. So incredibly simple, but so fabulous looking. I am very impressed with your ability to do such neat edge stitching. Mine is so wobbly and wavy. Do you have some very special technique or tip for getting it so neat - or is it just practice and lots of unpicking? 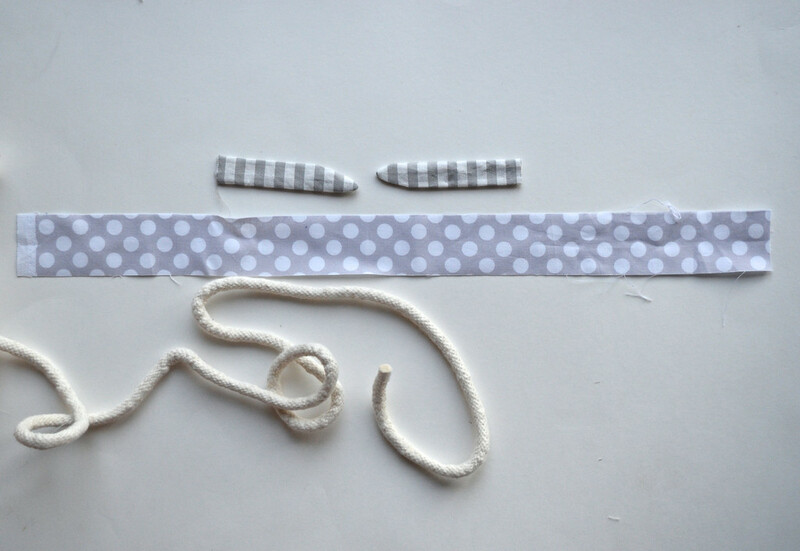 Kate - re: edge-stitching. I don't have a technique, really. Maybe it's practice. I have noticed that whenever I stop to reposition the fabric or tuck in SA (I tuck as I sew; I don't pin), the stitches go slightly wonky at that spot. So as far as possible, I try to sew continuously. Less stops = less wonky bits. Also I think it helps not to be nervous about sewing so close to the edge. I've sewn close to the edge for many years so it no longer frightens me that the needle might, say, slip off. And almost forgot to mention that my machine has an integrated walking foot, which I'm sure helps without my even realizing it. That said, it's possible to do straight edge-stitching without a walking foot - I did this for years on my old treadle and I have to confess that my workmanship was far better than than it is now. And people say youth is reckless. I beg to differ. I'm such a sewing klutz now compared to when I was 15 years younger. Thank you so much for this awesome series LiEr. I have spoken to many different sewers and some do truly just want to pay for a pattern and not have to think much, so they are happy with nothing too special apart from a pretty strap. But if I buy a pattern, I want something worth my money, not as you said, just paying for instructions on how to make a strap. 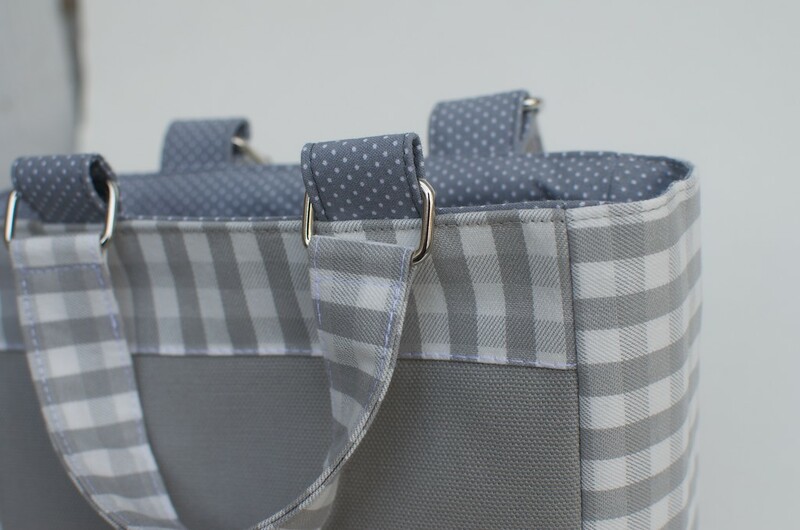 On my list of to-do's is a messenger bag for my 3yo, and I feel like you have increased it's value tenfold, because I wont be following a free tutorial and stumbling my way to a result, but I will be carefully designing all the wonderful features myself :) (Its probably going to look just like your beautiful grey one featured for the The Adjustable Slide-and-Buckle Strap lol). I have made several bags, but I confess I have NEVER considered the straps this carefully!! I will never look at them the same again! Wow. That integrated loop strap just blew my mind. I would never have figured that out on my own. I LOVE THIS SERIES!!! (yes I am yelling, can you hear me from your neighboring state - WI?) Your instructions make so much sense to me. So many bag patterns drive me nuts because they tell you to cut this then sew that, but not what you are doing or where / how it will be attached. I need to understand where I am going with a pattern for it to make sense. I really think that with this series I am going to be able to make just about any bag I want. Thanks LiEr!!! And I so will be linking to your series from my blog (probably later this week) so more people can see this! Thank you ever so much for this series. It is incredible generous of you to make this available to us, and for free! I have spent a huge amount on bag patterns, I would consider myself to be on intermediate level, but never did I come across instructions on how to make the integrated loop straps the way you explained. I must also compliment you on the photos, very clean and clear. 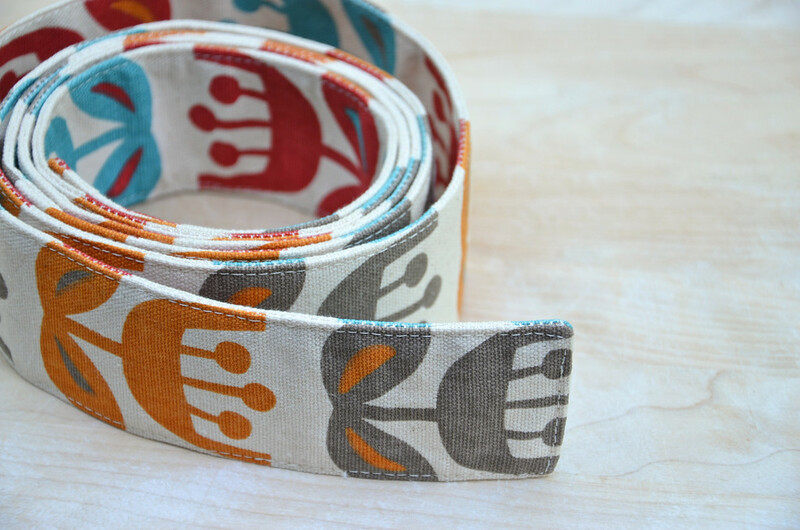 I cannot wait for your class on zippers! Ciao! Your tutorials are so great!!!! Thanks! This is so helpful. I tried doing a bag from a simplicity pattern and bungled it up royally since their instructions made no sense to me. This already has taught me way more. I bought fabric so i can start trying making some bags to try some of these out at the end of the tutorial series. Thanks a lot for these fantastic tutorials!!! i've made a link from my blog to your blog. quality, kindness, and perfection, great!!!!!! Thank you. I love this. That's what I needed. Thanks for this great tutorial! 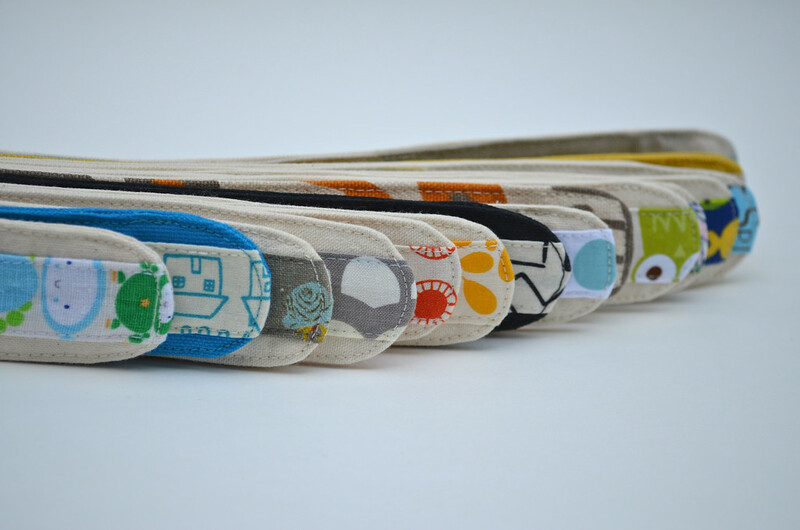 I've made many, many bags in the past few years, always searching for the best strap choice. This week I made a corded rouleaux strap with finished ends for the first time. Your instructions were very helpful. Thanks again! Hi there, just started sewing after a 40 year break ! Your instructions are fabulous and inspiring. Thank you so much. 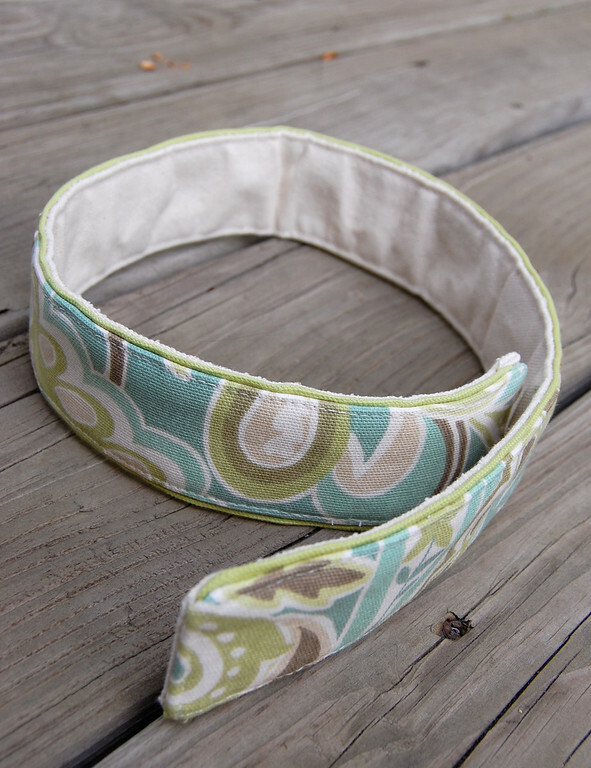 I can't tell you how much I LOVE your tutorial on many ways to make your own straps. It's so helpful, and will improve the fabulousness of my future bags. Do you, too, need bags to hold all your bags? What a wonderful problem to have! Thanks for your generosity in sharing these tutorials. I am a born again sewer, as a child I wasn't interested and had no attention span. As an older person I have the time and interest but my sewing is not neat. I get too excited to finish the project and feel sad that it looks sorta sloppy. I love making bags and I have made 2 , the first one I already gave away and the second one had to be ripped up because the straps were unsightly. Somehow the first was neater. I was searching for strap making when I hit at your site. Thanks again, I am going to try with renewed zest as well as some knowledge instead of just blind winging it. I love your truly integrated reversible strap! Thank you for the tutorials! I usually put off doing my straps until I have to put them on the bag because I hate doing straps. But these options may inspire me to try new ways. Love your tutorials! I'm in the midst of making a bag but it's on hold because I just can't find the right metal rings for the strap. and then I found your blog, and this post. The truly integrated reversible strap is truly inspirational. I never even thought it was possible! It makes me want to make another strap for my current project. and you know what? I think I will make a new strap (as soon as I find the right rings ;) ). PS: Have you made one with 2 fabrics? Thanks for the detailed work. You have every design I could need. Thank you for these AMAZING tutorials! I recently started sewing and I wanted to make bags but some things I just could not figure out. You have made it all so much easier! A really really wonderful tutorial! thank you for posting this! Brilliant!!! Love knowing how to do this! I'm super impressed with the professional look of your work and the choices of fabric. Simply beautiful. Your work is stunning. Love your fabric and color choices. Very professional. Really enjoy your site. Thank you for posting so many tips. I enjoyed your tutorials, learned some things, and was wondering what SA meant,then figured it out, seam allowance, by thinking about it, really hard...ha ha. I , too, have been trying to turn stuff that is nearly impossible, thanks for the information, on turning out small loops, this was brilliant. I love your bag you made for your mother in law, too. Where do you buy your hardware? I am wondering how to make an adjustable strap, do you make this? Thanks. Thanks for the help turning trash into treasure. Making coffee bag totes for presents.